There are a few Mould (Mold) quotation websites around but they seem very limited. Also, it appears that the prices generated are at best ‘finger in the air’! 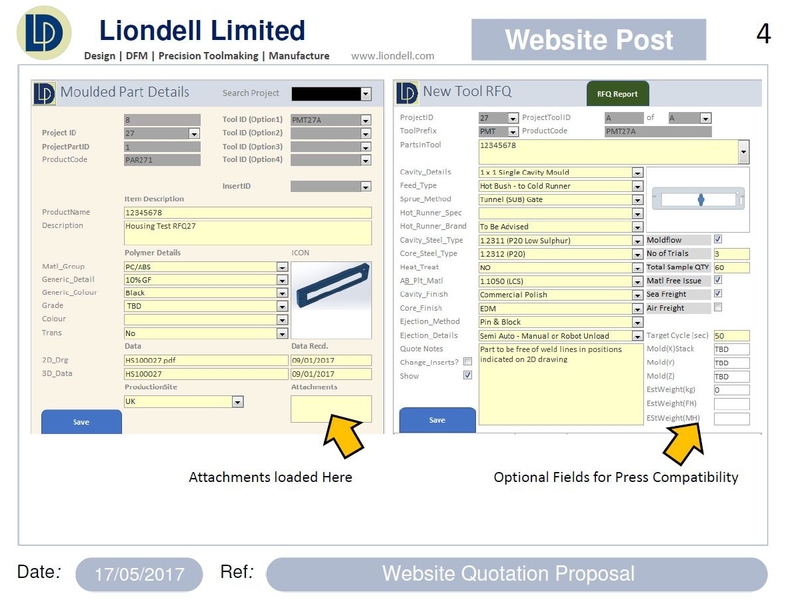 Liondell is committed to providing accurate, rapid response quotations. However, for the type of complex moulds that we build, we do not think that code generated quotations are ever going to beat an experienced designer looking at the enquiry. Is it feasible to ask a prospective client to fill out the necessary fields for each tool they require? From experience it takes 5 minutes to do the first one and 2-3 minutes for subsequent ones. Attachments can be loaded for each tool and full explanations will be embedded into the page. There would be only one or two tabs making for better functionality. Our Mold quotation Engineers will then review and will respond with detailed quotes usually between 12-24 Hours.